A great many Canadians continued to depend on wages and salaries in the industrial/manufacturing sector in the last quarter of the 20th century. Even so, the sector was changing dramatically. Industrialization a century ago required proximity to sources of energy, raw materials, shipping/railway infrastructure, and a source of cheap, skilled labour. The information age required different strategies. High technology industries were drawn to nodes where there was proximity, principally, to workers with extraordinary skills in computer sciences. The founding of software giant Corel in Ottawa in 1985 nearly coincided with the 1984 opening of Research In Motion (RIM) — eventually renamed BlackBerry Limited — in Waterloo, Ontario, which both depended on the dense population of science and engineering graduates from nearby universities. These also were flagships of what was called the knowledge economy. The post-secondary sector responded with increased investment in the “mobilization of knowledge” and commercialization. Just as Canadian industrialists once looked south to the steel industry of Pennsylvania and the auto industry of Michigan, late 20th century entrepreneurs, cabinet ministers, and local governments wished to emulate the success of California’s Silicon Valley, pairing entrepreneurial vision with fresh research coming out of the country’s leading universities. 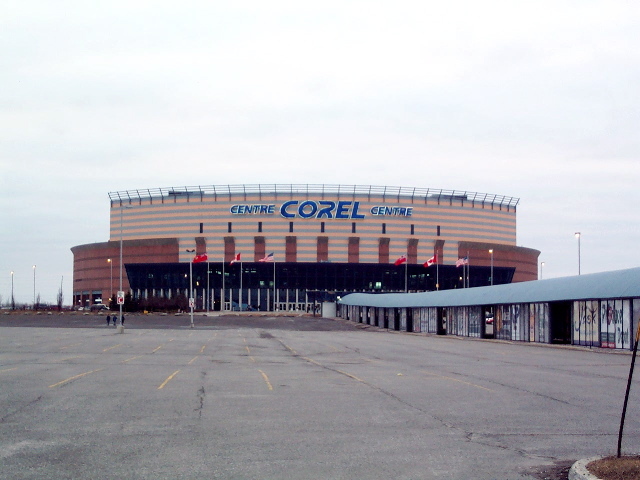 Figure 8.24 The enormous success of Corel was manifest in its $20 million sponsorship (and subsequent rebranding) of the NHL Ottawa Senators’ new home arena in 1996. It is probably too early for historians to judge the contrary currents flowing in the millennial decades. On the one hand, globalization was viewed as a source of deindustrialization; at the same time, labour in Asia and engineering skill in India in particular was critical to the rise of the information age. From about 2001, the knowledge economy and the creative economy are presented as heirs in a long succession of economic engines. Just as the agricultural revolution of the 18th century made possible, and gave way to, the industrial revolution in the 19th, they were both followed by the commercial and service revolution of the mid-20th century. To use a well-stretched analogy, this may be making a silk purse from a sow’s ear. Do we cheer the arrival of new activities so as to obscure the creaking sound from declining sectors? Without the agricultural revolution, there would not have been the food nor the people to run the industrial revolution; however, the former didn’t end with the start of the latter. The agricultural and industrial revolutions had an ongoing co-dependence then and, indeed, to this day. Industrialism provided the systems necessary to mass produce electronic goods, for example, and it also established — in partnership with state capitalism at mid-century and the rise of consumerism — the intellectual means and popular market for high-tech inventions. The extent to which the knowledge economy can lay claim to the “revolutionary” qualities with which it is sometimes associated has yet to be proven. A striking visual example of the rise of industrialism, and its retreat, can be seen along Vancouver’s False Creek. Currently, the subject of a significant urban plan, it is an area that has literally been re-formed repeatedly in the city’s 130 years. Figure 8.25 The False Creek mudflats at high tide in 1890, only recently denuded of trees but still a salmon spawning ground and a source of clams. Despite the name and the historic presence of several feeder ravines, it is not a creek at all but rather a short inlet that once had extensive mudflats at its eastern extremity. Aboriginal peoples harvested a range of foods here, including seals. Early Asian settlers grazed cattle and pigs across the marshes. European immigrants made similarly benign use of the flats until the late 1880s and early 1990s when slaughterhouses appeared on its south bank at the outlet of Brewery Creek. Waste from the eponymous breweries joined the dumping of offal and animal scraps into the flats, and residents and the city on the eastern and northern shore began disposing of their garbage in the most inland coves. By 1910 high tide marks were littered with all kinds of debris and gore. The eastern flats were drained and filled in between 1915 and 1917 to create space for new railyards and warehouses. 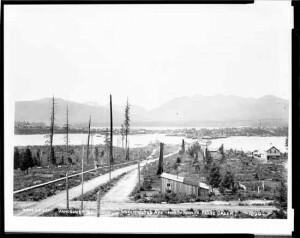 The remaining shoreline west of Main Street (repeatedly threatened with further massive drainage projects) was populated with sawmills and railyards from the 1880s forward. Huge beehive burners belched sparks and smoke over the city’s East End, and a towering gas plant hissed and glowed blue above Chinatown. There was little housing along False Creek before the 1970s, apart from shanty housing — mostly shabby floathouses without plumbing — and some nearby “coolie” housing (high density housing for single, and mostly poor, Chinese men). Sewage poured directly into the eastern part of the inlet, and the whole stank terribly. 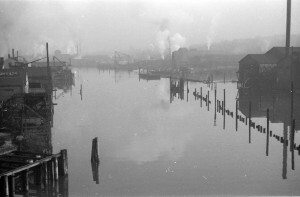 Shipyards joined metal-bashing and barrel-making industries along the south side of the inlet and grew at an enormous rate during the 1940s with the wartime production of “Liberty Ships.” Crossed by three bridges, False Creek was the heart of industrial Vancouver until the need for larger sorting yards pushed the lumber industry to the Fraser River; likewise, the shipyards shut down one after another because they needed bigger slips on which to build a new generation of larger peacetime vessels and a deeper, wider pond into which they could be launched. Figure 8.26 The Big Smoke. False Creek in 1936, its size reduced by one-third and its waters choked with log-booms. Incrementally vacated by industrial leaders, the northern portion of False Creek was spanned by two highway viaducts in 1972, with more freeways believed to be on their way. At that point, City Council developed a new vision of the area and, in partnership with the Trudeau government, began to redevelop the southwest side as a combination of street market and modest-density housing with green spaces and pedestrian seawalls. Granville Island Market was one outcome, and townhouses began to stretch eastward from Granville Bridge. 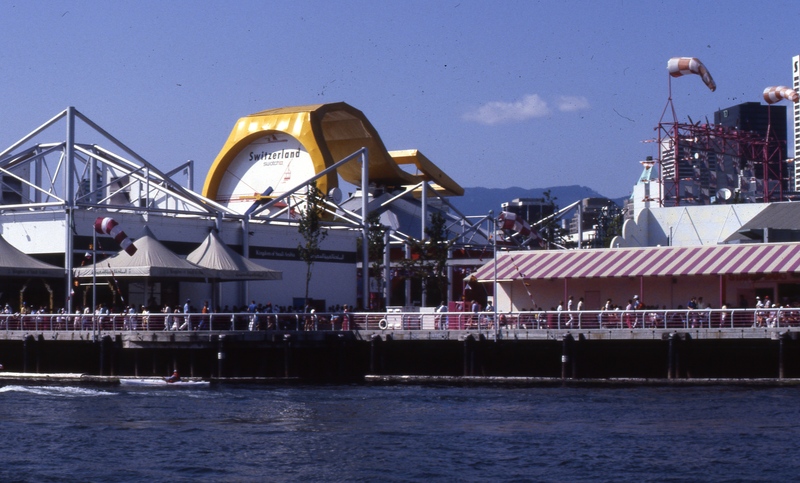 Consolidating the remainder of the land represented a challenge that was solved by hosting a World’s Fair — Expo 86. That opportunity cleared the way for converting the north shore of False Creek from industry to fairground and then to high density tower housing in the space of a decade. More glass towers followed on the eastern shoreline, leaving only the southeast corner for consolidation and bulldozing, which was done to host the 2010 Winter Olympics, and the athletes’ dormitories were quickly converted into market housing. 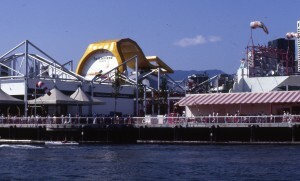 Figure 8.27 The Swiss Pavilion dominates this view of Expo 86. What was once — well within living memory — a smoky, rat-infested, industrial septic field is now a smart, green, sophisticated urban space. There are very few industries per se in the area, except for the return of craft breweries. What has emerged along the shorelines of False Creek is a highly photogenic example of the clean and urbane knowledge/creative economy. It is easy to lose sight of the fact that the industrial core that gave Vancouver its nickname — “the Big Smoke” — was also lauded in its time. Heavy industry and shipyards were profitable and they provided jobs for thousands of skilled and unskilled workers (including more than 10,000 women during WWII) who lived in the city core, on Fairview Slopes, and in the East End. More than that, these industries were symbols of patriotism in the 1940s and through the Cold War. Mills and factories were as much an indicator of Vancouver’s modernity as condo-towers are a manifestation of the city’s postmodernity. Similar reinventions of industrial lands can be seen in every Canadian city. Whether it is the Canadian War Museum (built on the railyard and working-class neighbourhood LeBreton Flats in Hull), the revitalized packinghouse district on the waterfront of Kelowna, or almost any new arena or stadium in the country, these brownfield projects re-purpose and, sometimes at enormous cost, rehabilitate industrial spaces for post-industrial use. 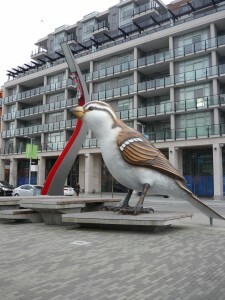 Figure 8.28 Myfanwy MacLeod’s The Birds dominates a public square in the Olympic Village condo complex in a thoroughly deindustrialized (but hardly natural) False Creek, 2011. Several factors brought instability to the Canadian economy after 1982. The rising cost of fuels and other components in the auto industry continued to reduce its profits. Startlingly high interest rates (close to 20%) gutted the housing sector and reduced consumer spending in the early 1980s. Growing environmental concerns rocked the pulp and paper and forest industries, resulting in a reduction of output and exports beginning in the 1980s and accelerating through the 1990s. Volatility in the stock market was also a destabilizing factor. Between the Wall Street Crashes of 1929 and 1987, there were no major stock market disasters, but then they started to come quickly. Black Monday on 19 October, 1987 was followed two years later by the dramatic collapse of the Brazilian stock exchange; in the summer of 1990, a three-year long recession began that was linked to Iraq’s invasion of Kuwait; in 1991 Japan’s meteoric rise ended with what was to be a two-decade long downturn; the common European currency, the Euro, experienced a crisis of its own in 1992; five years later, the Asian economic meltdown provoked a global crash of stocks and, in the summer of 1998, the Russian economy seemingly collapsed. The century ended with the dot-com bubble crisis that marked the end of a stunning run for Internet investors. This last aspect of the new post-industrial economy in some ways resembles the frenzy of railway building in the Victorian era. The Internet went from being a modest structure in the 1970s and 1980s to the World Wide Web — invented in 1989 and launched in 1991. It is now, along with cellular communications, the largest communication infrastructure in existence. At the consumer level, this is a vast and revolutionary change. More than 80% of households now use a cellphone only, having dispensed with landlines. The future of Canada Post is uncertain, and while it is still possible to send a telegram today, many do more for the sake of irony than efficiency. Canadians observed these changes unfolding in the 1990s and were uncertain. What potential did the Internet truly present? In 1989 only 10% of Canadian households had home computers; five years later, that figure had more than tripled to 32%; in 2000 it reached 65%. Until the late 1990s, these computers were essentially word processors: household Internet usage was only about 7% in 1997. Suddenly, in 2000, this leapt to 53%, and home computers were in a position to revolutionize domestic, civil, and social life. Again, in the mid-1990s, this transformation was being foretold by only a handful of early adopters. Resistance to these trends can be seen in the apparent inability of print media to develop new strategies for survival, which is evident in the closure of many local newspapers. At the same time, automobile sales continued to surge (sustained by sprawling cities), so deindustrialization was far from complete. As was the case in the past, the post-industrial economy did not utterly supersede the service or industrial or agricultural economies. Information technologies began in the late 1980s, and in the 1990s, began to mobilize more capital and labour, even as traditional manufacturing sectors declined. The knowledge and creative economies became increasingly referenced as cleaner and more sophisticated models that would replace dependence on industrial production. The Internet age began with a frenzy of investment that produced financial bubbles that inevitably burst. Technological change made significant inroads in everyday life in the 1990s, and accelerated at the turn of the century. The Corel Centre, now known as Scotiabank Place, in Ottawa by Steggall is used under a CC-BY-SA 3.0 license. View looking north on Main from 7th Ave. – False Creek before fill by H.T. Devine is in the public domain. View of mills on False Creek by James Crookall is in the public domain. Expo 86 – Switzerland by Colin Rose is used under a CC-BY 2.0 license. Sculpture of a sparrow in Olympic Village, Vancouver by Guilhem Vellut is used under a CC-BY-SA 2.0 license. 8.17 Post-Industrial Canada by John Douglas Belshaw is licensed under a Creative Commons Attribution 4.0 International License, except where otherwise noted.